Examples from the first period with centralised or so-called 'double-niche' designs, on which many of the motifs are mirrored vertically and horizontally, are even rarer than those with single niches. The majority of known examples may once have been in the churches in Transylvania, although only one survives there today, in the Black Church in Brasov. As with the single-niche rugs, they all have slight variations in their field designs but also form a close-knit group. They all have similar stylised floral sprays in their spandrels, and they have a large lamp hanging at each end of the field. 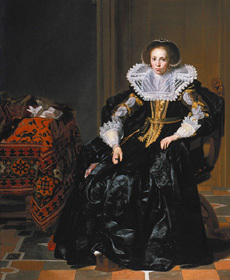 In Thomas de Keyser's Portrait of an Unknown Woman, 1632, in the Gemaldegalerie, Berlin, the narrow chain guard border is on both sides of the main border, the spandrels are light and the field is dark, similar to this Budapest rug. 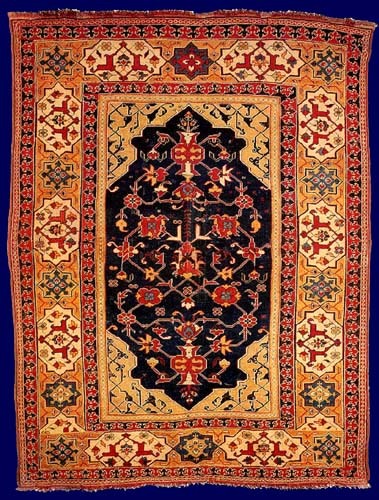 The de Keyser rug has just the star design in the border, without the cartouche. This border is unusual but not unknown - one such rug is in the Black Church in Brasov and another in the Evangelical Church in Biertan.